It’s never too early to begin work on your haiku film. We look forward to sharing your HaikuLife, video haiga, or other haiku video production with the haiku community. In-hand deadline: 10 April. The United Nations has designated 2019 as the Year of Indigenous Languages. We think this is an extremely charged topic, with many directions that it might take. Plan to share one poem or many in the world’s largest collaborative poem. Planning a special meeting? A meeting of your local haiku society? Any other haiku-related event? April 17 is a Wednesday this year, so we would anticipate that most local gatherings will take place on the weekend prior or following.Send us the details and we’ll list it as part of the IHPD2019 celebrations. Information deadline 10 April. Do we submit on the day or is it already happening? April 17 is celebrated by scholars as the day in 1387 when Geoffrey Chaucer’s “Canterbury Tales” characters begin their pilgrimage to Canterbury. How about a series of haiku pilgrimages (or walks to specific sites) where the walkers write haiku from the perspective and context of who they are – whatever they choose that to be – but focused on the walk and the destination site. They could collect them as a linked series. 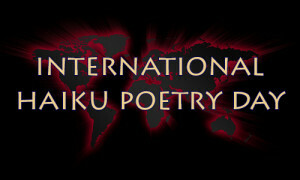 to celebrate April Poetry month I am going to commit to writing one haiku per day during the month of April. Have you thought of sponsoring such a competition before? would be a good thing I think. This date dovetails very nicely into our wedding anniversary and the theme serves to make the celebration of the day very close to my heart.